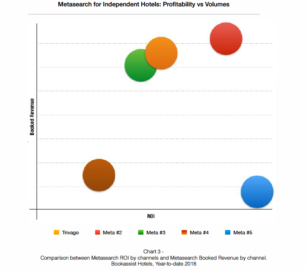 This article was written by Jacopo Rita, head of product for metasearch at Bookassist. According to recent industry buzz and rumors, Trivago has seen better times. Hardly a month (or even a week!) goes past by without an article or press release highlighting even more trouble for the metasearch site. The issues seem endless: Financial woes and a weakening competitive position as an effective marketing channel are compounded by online travel agencies pulling back on spend. But at the same time, we are still bombarded by Trivago commercials, and demand and interest from hotels in Trivago show no signs of slowing down. There’s no doubt about the steady interest in the company from the market, and it still remains a major player in travelers’ efforts to research, find and book the ideal hotel. So, what’s behind all these stories? At Bookassist, we work with hundreds of hotels to boost their visibility on metasearch sites, including Trivago. We collect a huge volume of data over time, and that gives us a privileged position in determining how effective Trivago is from an advertising perspective for independent hotels. And some positive news can’t be ignored. 1. 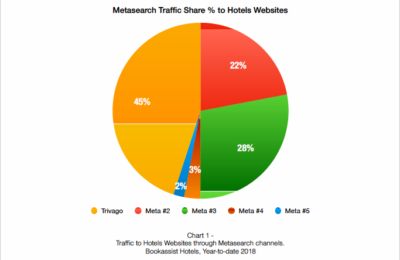 Trivago is still the metasearch leader in terms of traffic generation to hotel websites. 2. The ROI is there. 3. The volumes vs. profitability eternal dilemma: Trivago is fine here, too. 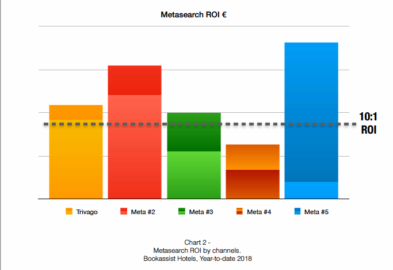 Trivago still drives lot of traffic to hotels websites at a reasonable cost of acquisition, given the ROI it delivers at a larger scale; and it’s actually the metasearch site – second only to Google – that gives the best balance between these KPIs. So, again: why all the negativity? 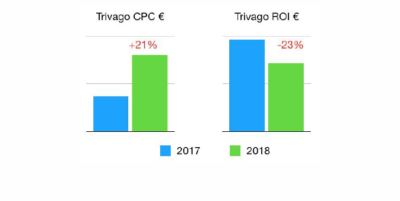 While the year-to-date figures above show some pretty nice and positive KPIs for Trivago itself as well as for Trivago’s effectiveness compared to other metasearch engines, the same can’t be said when those very KPIs get compared to the previous year. Trivago – as with any other digital marketing actions – has to have a long-term strategy, so looking at its growth (or decrease) over a longer time frame is a crucial task for hotel digital marketing managers – especially at this time of the year when 2019 budgets are due! When we look at Trivago’s growth through a year-over-year comparison, the picture changes dramatically. 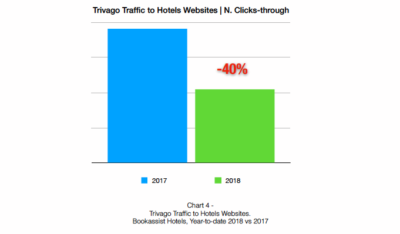 While Trivago is still the channel that delivers the most traffic to hotel websites (see Chart 1 above), the trend has actually decreased quite significantly compared to last year, showing a concerning up-to 40% drop for some hotels. 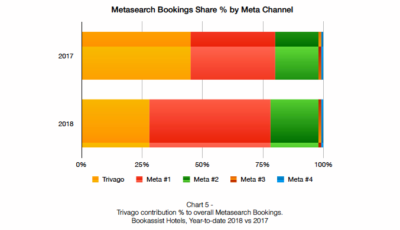 While metasearch as a whole has been growing, Trivago has been falling behind, not only in terms of traffic generation (see Chart 4), but also in terms of contribution to bookings for hotel websites. At the end of last year, Trivago rolled out a major update to its algorithm that determined how advertisers ranked in the auction. While Trivago always has been proud of its price-win auction dynamics (resulting in giving first position to advertisers with the cheapest room rate), this has all now changed to a bid-win dynamic: Room rate is no longer a way to guarantee a first position in the ranking. Whether this has been done in a desperate effort to try to keep OTAs onboard (as they had started pulling back on spend) or as a way to increase revenue (it’s hard to say, but it’s likely to be a bit of both ), the outcome is the same: This move has only penalized independent hotels and, in particular, the effectiveness of their pay-per-click investments on Trivago. The result is a higher cost-per-click (Chart 6 below) and, as a consequence, less traffic to hotel websites. Less traffic to hotel websites at a higher cost of click acquisition can only lead to a decrease in profitability, as has happened to many hotels. On the consumer side, overall popularity of Trivago also seems to have taken a nose dive. Again, comparisons to last year show fewer users – apparently – using the Trivago search engine, which Trivago also states in its quarterly reports when significant decreases in qualified referrals are reported. Trivago’s changes to its algorithm didn’t only affect profitability of hotels investments – it has also compromised its value proposition to its customers. How can you promote yourself as the go-to place to find the best price if the results don’t reflect that? There’s disconnect here between brand promise and user experience. And this can be certainly one of the reasons why Trivago, as a brand, has lost some popularity compared to the past in users’ eyes. So while bidding and ranking algorithm changes were crucial to the effectiveness of hoteliers’ investments in Trivago (which turns into a higher or lower profitability), attractiveness of Trivago to travelers is now crucial in terms of potential volumes that it can drive to hotels. These are the two key areas that need to be looked at closely to ensure ongoing successful performances for hotels, and we expect (and hope!) that these are the two main areas where Trivago moves next. Like everything involved in technology and the digital ecosystem – and when it comes to metasearch advertising, even more so! – change is the norm, and the speed of change is the paradigm. 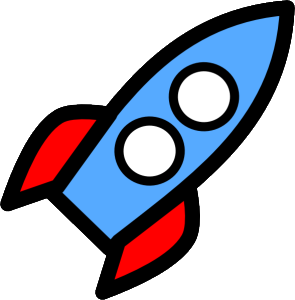 Things change so quickly, so often: Reacting to change – and adapting on time – is the key to staying competitive. This is the same approach that needs to be taken with Trivago. Trivago is still delivering positive KPIs as an advertising platform, and it’s a cost-effective channel, especially compared to a number of other digital advertising options hotels can choose. This can’t be ignored by independent hotels in their quest to drive direct bookings. Trivago is still the leader in terms of traffic acquisition in the meta landscape, especially for properties located across Europe: There’s a lot of traffic to hotels online (official websites or OTA listings) through Trivago, which it makes it a worthwhile channel. Conversion rate optimization is the key when it comes to converting Trivago’s huge traffic into bookings. Hotels need to be well-equipped for that, with outstanding landing pages, well-performing booking engines and, last but not least, an optimized user experience for mobile devices (since 70% of traffic on Trivago is through mobile). These are some of the tactical actions required to maximize the Trivago opportunity.